The Lord blesses the Nephites; the Nephites become proud and sin; prophets call the people to repentance; the people are punished; and then the people are humbled and repent. At this point the Lord blesses them again, they become successful, then proud, and the “pride cycle” repeats itself. It appears that pride led to abuse of the poor, and that this abuse of the poor led to the destabilization of the church and of society. As Mormon noted, “And some were lifted up unto pride and boastings because of their exceedingly great riches, yea, even unto great persecutions” (3 Nephi 6:10). The ancient conquest of Canaan may provide a parallel. According to some archaeologists, surviving artifacts reveal that when the Israelites conquered Canaan, some Canaanites joined them. These Canaanites were the poor, marginalized members of society who joined the Israelites to fight their oppressive overlords. For example, when the Israelites invaded Jericho, a woman named Rahab harbored the Israelite scouts, helping the invasion succeed. As a prostitute, Rahab would have keenly understood what it meant to be an impoverished and disenfranchised member of society, and this may have made it easier for her to turn against the rest of the city (Joshua 2:14–15). Care for the poor has always been a core tenet of Christianity from the beginning: “Pure religion and undefiled before God and the Father is this, To visit the fatherless and widows in their affliction” (James 1:27). Yet it is easy to miss the full ramifications of what it means to care for the poor. 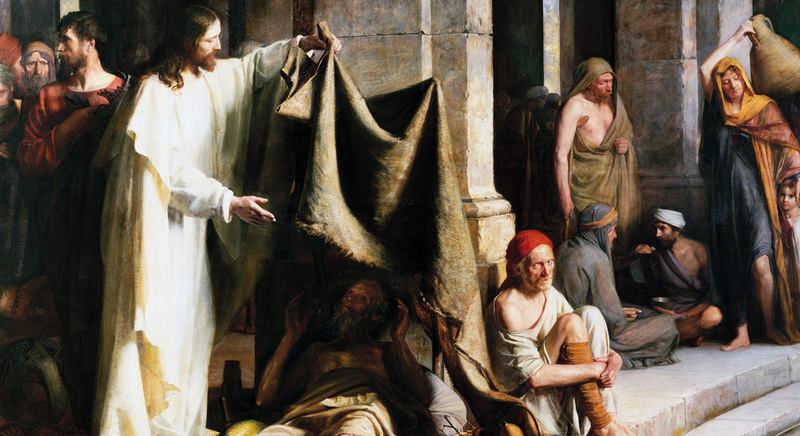 In Canaanite and Nephite society, care for the poor may have helped preserve the country. The Book of Moses records one case where this seems to have happened. The Lord has instructed us that the stakes of Zion are to be ‘a defense’ and ‘a refuge from the storm.’ We have found refuge. Let us come out from our safe places and share with (others), from our abundance, hope for a brighter future, faith in God and in our fellowman, and love that sees beyond cultural and ideological differences to the glorious truth that we are all children of our Heavenly Father. Lindon J. Robison, “No Poor Among Them,” Journal of Book of Mormon Studies 14/1 (2005): 86–97, 130. Lindon J. Robison, “Economic Insights from the Book of Mormon,” Journal of Book of Mormon Studies, 1/1 (1992): 35-53. See for example, Helaman 3:25–26, 32; 11:20–21; 3 Nephi 6:1–9; Helaman 3:33–34, 36; 4:11–12; 3 Nephi 6:13–18; 2 Nephi 25:9; Helaman 7:13–28; 10:14–17; 3 Nephi 6:20, 23; Helaman 4:1–2, 11, 13; 11:1–6; 3 Nephi 9:1–12; Helaman 4:14–15, 20–26; 11:7–11, 15; 3 Nephi 5:1–6. For another example of a time when the pride cycle manifested itself among the Nephites, see Book of Mormon Central “How Did The Nephites Become Weak In Such A Short Time? (Helaman 4:25),” KnoWhy 175 (August 29, 2016). See Book of Mormon Central “Why Did Nephi Prophesy Near ‘The Highway Which Led To The Chief Market?’ (Helaman 7:10),” KnoWhy 178 (September 1, 2016). Joseph A. Callaway and Hershel Shanks, “The Settlement in Canaan: The Period of the Judges” in Ancient Israel: From Abraham to the Roman Destruction of the Temple, 3rd Edition, ed. Hershel Shanks (Washington, DC: Biblical Archaeology Society, 2011), 59–83. This point was overstated for many years. Some scholars went so far as to state that there was no conquest from the outside, and that what some considered to be the conquest of Canaan was actually just a massive peasant’s revolt. Then the pendulum swung the other direction with people saying there was no civil unrest during the Israelite invasion of Canaan. However, most scholars now realize that an uprising of the poor against the rich was one significant contributing factor, among others, to the conquest of Canaan. For an exploration of these different approaches, see Hershel Shanks, William G. Dever, Baruch Halpern, and P. Kyle McCarter Jr., The Rise of Ancient Israel (Washington, DC: Biblical Archaeology Society, 1992). The word used to describe Rahab is almost certainly not the same word used to describe the more affluent or respected prostitutes associated with ancient temples, implying that Rahab was not well off. Lawrence E. Stager, “Forging an Identity: The Emergence of Ancient Israel,” in The Oxford History of the Biblical World, ed. Michael D. Coogan (New York, NY: Oxford University Press, 1998), 103–104. For how to avoid pride, see Book of Mormon Central “How Does Nephi Use Isaiah To Teach Us To Avoid Pride? (2 Nephi 15:21; Isaiah 5:21),” KnoWhy 48 (March 7, 2016). There are at least two places in the Book of Mormon where prosperity did NOT lead to pride and destruction (for a while). The reasons are inspiring: Alma 1:30 - And thus, in their prosperous circumstances, they did not send away any who were naked, or that were hungry, or that were athirst, or that were sick, or that had not been nourished; and they did not set their hearts upon riches; therefore they were liberal to all, both old and young, both bond and free, both male and female, whether out of the church or in the church, having no respect to persons as to those who stood in need. And thus they did prosper and become far more wealthy than those who did not belong to their church. Alma 62:49 - But notwithstanding their riches, or their strength, or their prosperity, they were not lifted up in the pride of their eyes; neither were they slow to remember the Lord their God; but they did humble themselves exceedingly before him. Yea, they did remember how great things the Lord had done for them, that he had delivered them from death, and from bonds, and from prisons, and from all manner of afflictions, and he had delivered them out of the hands of their enemies. And they did pray unto the Lord their God continually, insomuch that the Lord did bless them, according to his word, so that they did wax strong and prosper in the land. "Caring fr the poor" does not mean abdicating that responsibility to some cold, bureaucratic system. In Moroni 18:28 it states that the people "should impart of their substance of their own free will and good desires before God." Having lived in a socialist country, I can attest that e forced welfare system actually robs the individual of a charitable heart and incentivized others to not work. Thus socialists systems will always rob us of free will.